One year ago, on June 17, 2015, an armed gunman walked into the Emanuel African Methodist Episcopal Church in Charleston, South Carolina. Dylann Roof entered the church — one of the oldest, historically black churches in the South — and after joining the group during their bible study for an hour, he shot and killed nine black Americans. A year has now passed since the tragic shooting, but such shootings have only continued in that time. Many called for stricter gun laws across the country after the Charleston shooting, as they did after Sandy Hook, and as they've done since then after San Bernardino, but there have been at least 10 bills after Charleston that could have been passed — and a number of others even before Charleston — to prevent such tragedies that ultimately weren't. In the last year, there have been at least 51 shootings in Charleston and at least 445 total shootings across South Carolina. The number of incidents that have plagued the country as a whole in just the last six months also paints a harrowing picture of this widespread issue. So far in 2016, there have been 23,592 gun-related incidents across the country, including 139 mass shootings, which resulted in 6,050 lost lives, according to the Gun Violence Archive. Gun reform and stricter gun policies won't prevent every tragedy; firearms are symptomatic of a greater problem. However, if any number of the firearm bills that have been introduced — for instance, to reform background checks or restricting the possession of a firearm and attribution of ammunition — had been passed in Congress in the last year, there's a chance that at least some horrific attacks could have been prevented. Not much has changed in South Carolina in the past year. Since the Charleston shooting, South Carolina still does not require background checks, does not limit the number of firearms that any individual can purchase at a time, and does not regulate the sale of ammunition. Not much has changed at the national level, either. 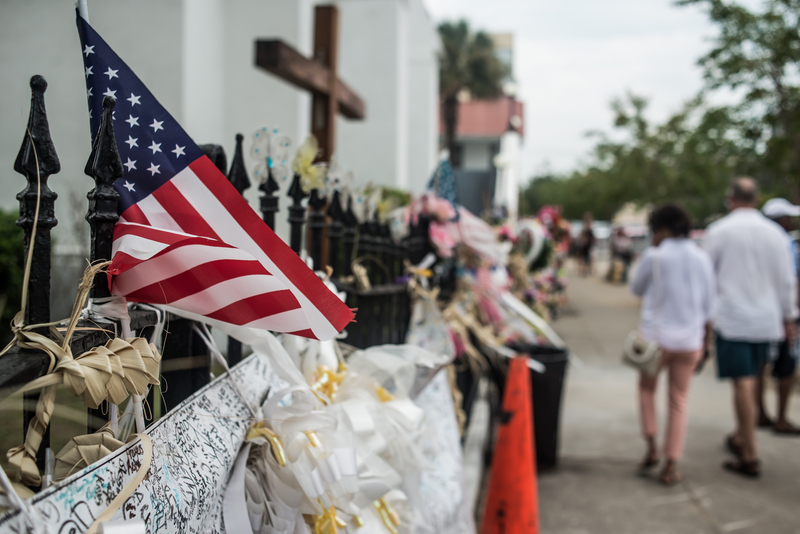 There are over 90 gun-related bills in Congress, including multiple bills in particular that could have prevented the Charleston shooter from obtaining a gun. While some of the bills waiting to be passed are sponsored by the NRA and fall into the scope of protecting the rights of gun owners, a number of them address the need for background checks of individuals. Those include the Keeping Guns from High Risk Individuals Act, the Background Check Completion Act, and the Fix Gun Checks Act of 2016, to name a few. All of which have pretty self-explanatory names. Some of the other bills waiting to be passed aim to keep guns away from people who have a history of domestic abuse or who are suspected terrorists. These bills align with addressing the loopholes of background checks. This includes the Domestic Violence Gun Homicide Prevention Act of 2015, the Zero Tolerance for Domestic Abusers Act, the Mental Health Access and Gun Violence Prevention Act of 2016, and the No Guns for Terrorists Act of 2015. It's important still to question who would be classified as a suspected terrorist, especially considering that a majority of mass shootings in the United States have been carried out by white men, who are also less likely to be classified as "terrorists." Though the federal government has not passed any bills to reform the country's gun laws, many states have enacted a number of laws to prevent such tragedies. Most recently, California passed 11 gun reform measures that address domestic violence, guns on campus, gun violence protective orders, and measures to close background check loopholes. Even though there is progress at the state level, it's not enough to ensure that tragedies like Charleston and most recently the mass shooting at Pulse nightclub don't happen again. It's telling that not a single gun control law has passed in Congress since the Sandy Hook school shooting in 2012. As each tragedy occurs, and politicians respond with their required expressions of sympathy, grief, and the call to change the nation's current gun laws, these tragedies also pass, and the general public's collective consciousness dwindles away. So, what are we going to do this time to prevent another horrific shooting from happening next time? These 10 bills could be a good start.